Ideal for controlling groundwater infiltration in most underground concrete structures including manholes, tunnels, vaults and basements, the PGS-500 portable grouting system is rugged, reliable and easy to operate. 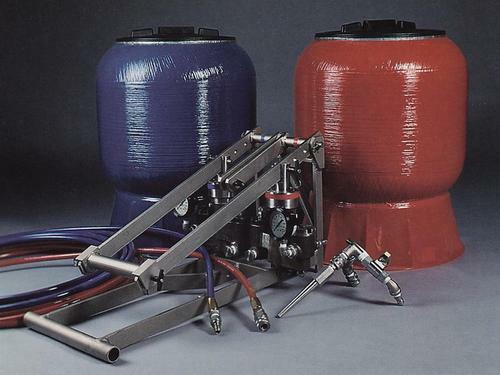 The complete system includes twin HO-500 grout pumps, two eighteen gallon (18 gal. - 68 liter), free-standing fiberglass chemical tanks, and two six-foot (6' - 1.8m) low pressure hoses with polypropylene ball valves. the system also includes two thirty-foot (30' - 9m) high pressure hoses with removable stainless steel hose ends and quick disconnect fittings. The tanks and hoses are color coded to prevent mixing errors and each tank has a large (12") fill hole with a threaded polypropylene lid. All components are made from corrosion resistant materials. The core of the system, the venerable HO-500 pump, is one of the only grout pumps in the industry that can operate both manually and pneumatically. Many jobs may be performed without an air compressor. The all stainless steel HO-500 pump is a positive displacement flooded intake design with static type Teflon packing rings which protect the cylinder walls from abrasive admixtures or contaminants. The HO-500 will pump many two-component, solution type grouts at rations from 1:1 to 3:1 and at pressures up to 1000 PSI (70 bar). The HO-500 pumps and optional air motor are mounted to a unique stainless steel frame using quick release ins that enable each pump to operate in sync or individually. The quick release pins allow swift removal of the pumps and air motor for maintenance. Each pump is equipped with a high-presure fluid filled gauge. An optional stainless steel tapered grout point injector, and manifold valve assembly are also available.